This is the first Essie nail polish I have ever bought and I love it! I think it may be the start of an obsession. Although at €12.99 a pop I will probably have to refrain myself. I have lusted after Fiji for some time now but Essie is particularly hard to find in Ireland, but low and behold Boots have now introduced the entire Essie line into their stores which is amazing. Anyway back to the polish. The formula makes it a dream to apply and it gives a beautiful finish. In the above picture I have applied two coats for full opacity. The shade is a lovely soft pink which would match any skin tone. I did find that it chipped after about 2 days wear but I think I am rough on my nails because unless I have gel nail on my polish never lasts. 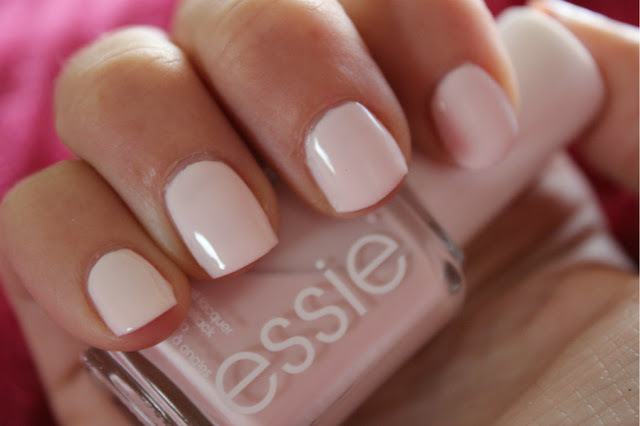 What are your favourite Essie colours? Ooooh i love this colour! what a lovely soft pink! I just found your blog through the beauty blog hop. Love it already. While I love this color I cannot paint my nails with it since I find it so streaky. This is a salon only color for me. I love that color! Essie is one of my favorite brands, they have such a great variety and the cutest names for each shade! Love this colour and essie! They have recently come on my radar! Followed you after the #bbloggers chat! I love the color.. Its a great nail polish too! It's a really pretty colour on you! This is a really cute colour.